One of the first things I do after I install a Windows Operating System is to make sure I have access to all hidden folders and that i can see the extension for all files, including common files like ".txt" or ".doc". That is because I want to have complete access to every file or folder from my system. To make these settings in Windows XP it was pretty easy - while I was browsing through the folders on my system, I selected Tools and then Folder Options from the top menu of Windows Explorer. When I used Windows Vista for the first time I was a bit surprised to see that the Tools menu is nowhere to be found in Windows Explorer. So where did it go? 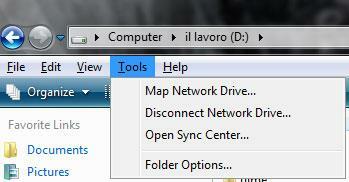 It seems that it was hidden from the Windows Explorer default interface. In order to access it, press the ALT key on your keyboard and the old menu will appear. In Windows 10 First open the "File explorer". You can click the search icon (magnifying glass) in the bottom-left corner of the screen or just push "Windows Button + E". Now click "File" button in the top-left corner of the box and then select "change folder and search options". Open the "View" tab like shown in the third picture on this page and choose the settings you want and when you're finished click "apply". 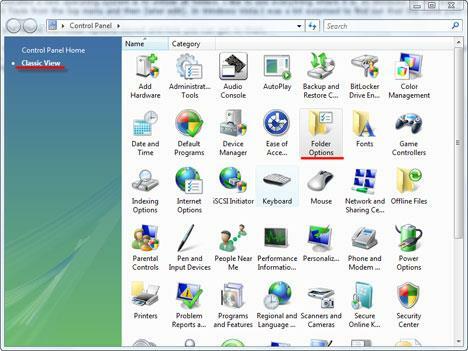 Another fast way to find the Folder Options is to use the search box from the start menu. Simply type "folder options" in the search field and the first result should be the Folder Options shortcut. Click on the it or press the Enter key to open it. Go to the View tab and make the settings you want. If you want to use the new Control Panel, you need to go to Appearance and Personalization and then click on Folder Options. If you use the Classic View you will see it in the list of items starting with the letter "f". Open up an explorer window (say for example, by clicking on the computer icon in the desktop), and then press and hold the left ALT key. You'll see the tools menu and under it you'll see the folder options. Before you bash windows vista next time, how about if you learn how to use it next time ? Nobody is bashing Windows Vista. We are just telling people where to find the Folder Options menu. Anyway... thank you for the tip. We updated the article and now it includes the tip you posted. There is an other way : just click on "Organize" and select "Folder and search options"
I will most certainly bash this confusing and poorly put together operating system. I can't think of an excuse for something this 'counter-intuitively' put together. Our IT people and computer geeks I know are telling us to AVOID this system. And word is that Microsoft is kicking it to the curb. Thanks for this helpful site, though! My senior Mom who's used computers for years was completely lost until we found your site. After 6 months, she absolutely hates Vista! what if "Folder and Search Options" is grayed out? Kind of a week article, this one. To have the menu bar always shown, select "Menu Bar" from Organize > Layout. Then you can always see the Tools menu. 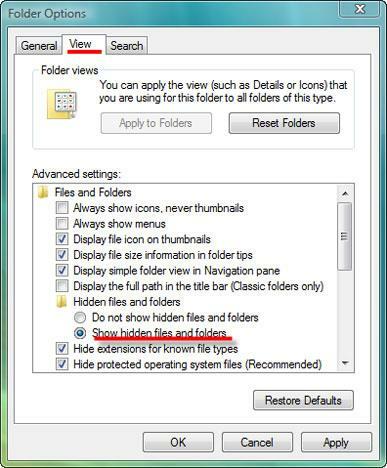 Reopen the Windows Explorer and Vista will dismiss all your settings. That is one of the new "Vista WOW! :(((" features. Some registry tweaks will patially fix the problem for the HDD's, however CD/DVD's will be shown with the "Vista" settings, no metter ho many times you will try to save your settings. The "Cool" view of the "Product" - means nothing if it is unable to serve the customer. At this stage I will not advise my customers to install Vista. Hi i am new to vista. i am not able to view folder options in control panel or Organize. i tried it. few days ago i change properties of some file as hidden but now not able to view them. need some solutoins. Have you tried to search the terms 'folder options' in the Start Menu search field? Under Tools, then Options, in XP I could see File Types. I do not see that here now, even after following this advice. Any tips? I like the flat folders view that is in windows XP. Can I have that view in Vista? 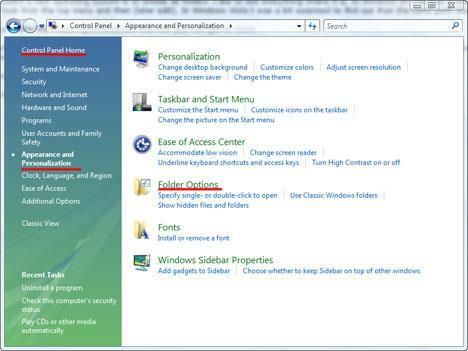 Hi, we have vista and after we installed sp1, "search" from Start menu (on the right side) is missing. How to get it back it again? how about how to get to File Types? they nuked the File Types tab in Folder Options, so i have no idea where they put it now. So far, the way Vista PRESENTS itself to the user is very nice. Many design flaws have been addressed from XP. What about the file order in the folders? Does anyone know how to organise a folder by order of dates modified? It took long enough to get used to that in XP, and with Vista - it seems to be AWOL. Is it just hidden somewhere? If it's not there, can someone suggest what kind of application might have that ? I lost my hibernate command on the start button and has not been able to recover it. How can I do it?